It’s really clean and have 24h services, which is really convenient for us to check in and out and also storage our luggage. Rooms small and not very clean. Staff was good and helpful. Location near the Metro and busses. Very clean, comfortable, friendly. Basic accommodations, no frills, but very adequate for a short stay. Strong wi-fi. Easy access to transportation and restaurants. Key words .. New .. Clean .. Friendly .. Delicious Food .. everything to really pamper you .. Nice clientèle .. loved the open air fitness facility .. Go Now when the prices are still at launch level of this little oasis .. Will go back ! Nice place to stay. 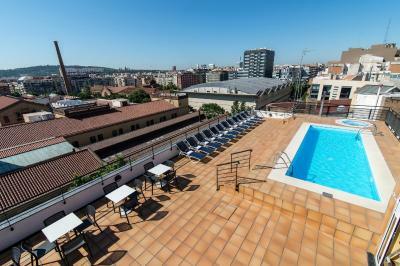 Pool on the rooftop with a great city view. It's a simple hotel but very comfortable and clean. The location is not very central but it's super easy to move around, very close to the subway. The staff was wonderful and helpful. Neighborhood was not great - but we were closer to neighborhoods outside of the tourist city center, although not located on a central street. Felt out of the way from many things. At least a 15 min walk to close locations. 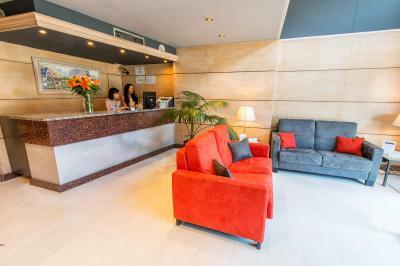 Sunotel Junior This rating is a reflection of how the property compares to the industry standard when it comes to price, facilities and services available. It's based on a self-evaluation by the property. Use this rating to help choose your stay! 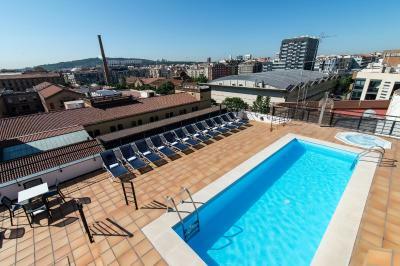 Offering panoramic views from its rooftop terrace, which has a seasonal hot tub and swimming pool, Sunotel Junior is set 1,000 feet from Francesc Macià Square. It offers free, high-speed WiFi. 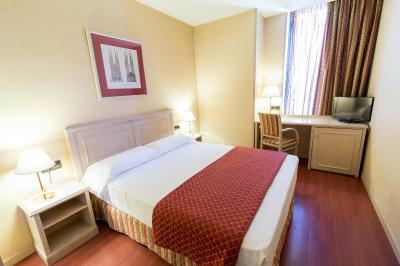 All rooms at Sunotel Junior have air conditioning, a flat-screen TV, soundproofed windows and a fully equipped bathroom. 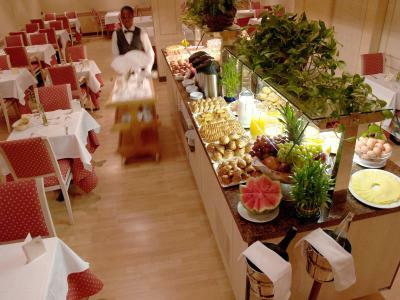 Guests can enjoy a varied buffet breakfast each morning. 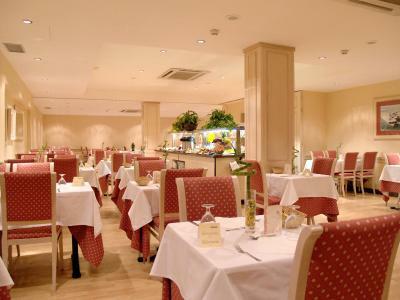 The hotel’s restaurant, Travel&Eat, offers a selection of dishes from around the world. There is also a range of cafés and restaurants nearby. You will find a 24-hour reception that offers a luggage storage service and free pool towels. There are also several meeting rooms available. 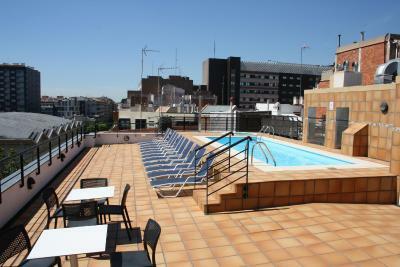 The Sunotel is a 5-minute walk from Hospital Clinic Metro Station, and Sants Railway Station is just 2 metro stops away. 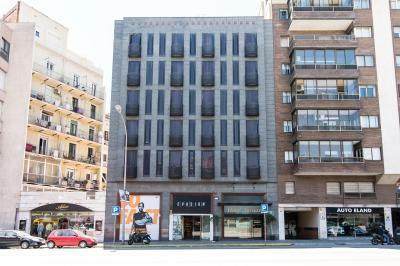 FC Barcelona’s famous Camp Nou Stadium can be reached in 15 minutes by public transport, and Plaza de Catalunya and Las Ramblas are also around 15 minutes away. When would you like to stay at Sunotel Junior? This single room features a flat-screen TV and free WiFi. The private bathroom comes with a bath tub and shower, and includes toiletries and a hairdryer. This elegant room features 1 double bed, a flat-screen TV and free WiFi. The private bathroom comes with a bath tub and shower, and includes toiletries and a hairdryer. This elegant Family Room is made up of 2 interconnecting double rooms. There is free WiFi and a flat-screen TV. The private bathroom comes with a bath tub, shower, toiletries and a hairdryer. 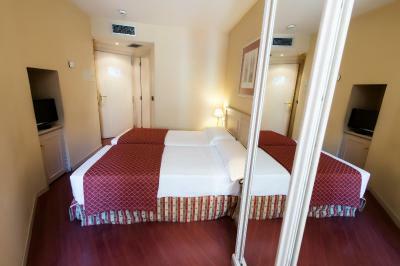 This elegant room features 2 single beds and has a flat-scren TV and free WiFi. The private bathroom comes with a bath tub and shower, and includes toiletries and a hairdryer. 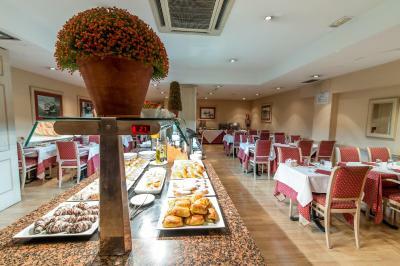 Hotel surroundings – This neighborhood is a great choice for travelers interested in architecture, food and culture – Check location Good location – show map Guests loved walking around the neighborhood! House Rules Sunotel Junior takes special requests – add in the next step! Sunotel Junior accepts these cards and reserves the right to temporarily hold an amount prior to arrival. Please note that the pool is open from 10:00 to 20:30. All guests under 18 years must be accompanied by an adult. Gluten-free breakfasts are available under previous request. You can use the Special Requests box when booking or contact the property. Please note, reservations for 2 adults and 1 or 2 children can only be accommodated in the Family Room. The internet would not keep me logged in and continued to cut out. I couldn't say on WhatsApp. The building is very old and smelly the carpets and the walls stin. They should demolish the building (or renovate)and build a new one. If you don’t want to demolish the building drop the price to half. Nothing ales expect the location, the location was close to my girlfriend house. Thin walls, you can hear noises from other rooms. Some people can be disturbed by this. The pillows are to small !!! Also I payed for parking but I didn’t come with the car. There was very cold in the room, heating was working very slow. Some of contacts didn't work. There is not enough light in the room. Some of items of my clothes were missed, I complained about that to the reception and in 6 days didn't get any answer - no items, no apologies. Bed was good. Wi-Fi was pretty good. The building was old, it smelled stale, and the air conditioner was covered with mold and dust. There was a lot of noise in the air-conditioning system all night. Maybe it wasn't cleaned properly. There was a lot of hair on the floor. The room could of done wth tea and coffee making facilities but this would not stop me booking there again. When we arrived at the Sunotel Junior the receptionist kindly upgraded us to the Sunotel Aston which was clean and tidy. The staff was very kind and they cleaned every day our room. The location is not central but it is very safe area. 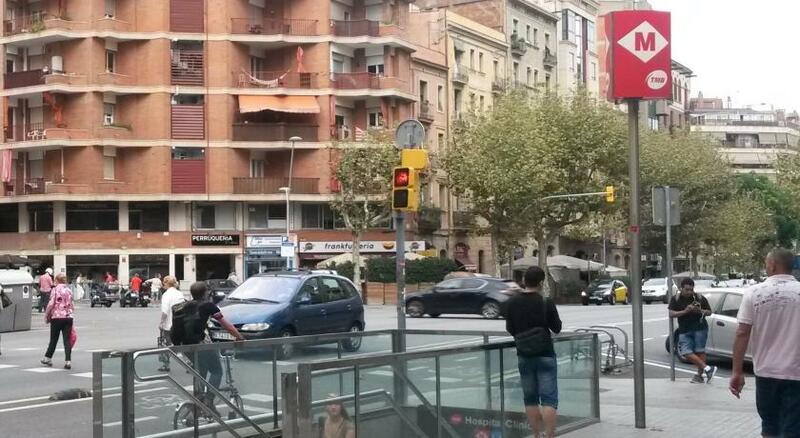 The metro station is very close to the hotel. The hot water was shut down and have to use another bath in the other hotel. Pillows to high and not comfortable, noisy lift and unable to sleep most nights as the room is next to the lift. Friendly receptionist, daily room cleaning.